Strap in for travels beyond the galaxy, to tranced-out cosmic bliss! 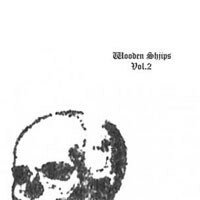 Sick Thirst presents "Vol 2", the second compilation of hard-to-find Wooden Shjips tracks. "Vol 2" digs deep to collect the band's Sub Pop and Mexican Summer singles, two self-released European tour singles, and a track from Yeti magazine, for nearly 44 minutes of fuzzed-out psych jams. Not just for completists, "Vol 2" contains the essential live standards "Loose Lips", "Death's Not Your Friend (live)", and "I Hear the Vibrations (the E-Z Version)", plus savage covers of Neil Young's "Vampire Blues" and Serge Gainsbourg's "Contact". Wooden Shjips is a trance-rock quartet from San Francisco, consisting of Omar Ahsanuddin (drums), Dusty Jermier (bass), Nash Whalen (organ), and Ripley Johnson (guitar and vocals). Their sound, as I'm sure you all know now, has hints of krautrock, the trance-inducing organ haze of Suicide, Velvets-style dance-drone, classic desert-fried garage psych and the mysterious, obscure Japanese lysergic-rock band Les Rallizes Denudes, all mixed into one explosive whole.